The Huffington Post reports that despite a judge’s order to reunite migrant children who were separated from their families at the border, the actual progress of this move is more of a crawl, if it could even be called that. In court filings, lawyers reported that 565 children, including 24 who are younger than five, remain in government-contracted shelters, separated from their parents. To put this in perspective, that’s only 7 less than the number reported two weeks ago. 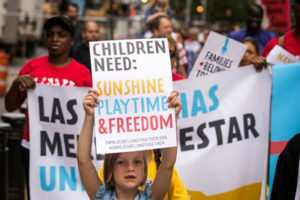 The start of the reunions was supposed to be in June when U.S. District Judge Dana Sabraw ordered the Trump administration to reunite the more than 2,500 children split from their families. Once knowledge of the practice had become public, it garnered widespread condemnation from both in the country and abroad. According to the government, the remaining children are still in custody because their parents had been deported, had failed a background check or had yet to be located. The court filing shows that the parents of 366 of the detained migrant children are currently outside of the U.S., keeping them from being reunited. The current administration is also targeted by a lawsuit from the American Civil Liberties Union, which is currently leading the way of ending the practice of separating people at the border. n the report filed in early August, the Trump administration’s lawyers argued that it was on the ACLU and its “considerable resources” and network, to locate the parents of the detained children, but Sabraw disagreed. “And for every parent who is not located there will be a permanently orphaned child, and that is 100 percent the responsibility of the administration.” While 2,089 migrant children of the total 2,654 who were taken from their families had been reunited, this is little comfort to the remaining children who are still separated, as well as those who are concerned with the direction that the country’s approach to immigration is taking.